Ace filmmaker Neeraj Pandey and Siddharth Malhotra have released the official poster of their next film – Aiyaary. This was followed by release of Aiyaary motion poster. The film also stars Manoj Bajpayee and can be a career changing film for newcomer Siddharth Malhotra. Aiyaary‘s official movie poster was released a day before, and it looks dark and gritty with a small line under which reads, ‘Based on True Events’. While the story line is still being kept under wraps, Director Neeraj Pandey has revealed that the movie will revolve around the relationship of a mentor and a pupil who travel around Delhi, Kashmir and London. The film will be shot on actual locations and shooting is slated to begin in May 2017. “These incredible characters exist and the incident actually happened,” revealed a source close to the actor and the filmmaker. Since the movie stars Manoj Bajpayee and Siddharth Malhotra, it’s safe to assume that Manoj will be playing the role of mentor, while Siddharth will be the pupil. This will be the first time we will see the SOTY actor in serious role as previously, he has only been seen in romantic movies, barring Brothers. This is also the first time that the two actors will be sharing screen space and it will be interesting to see how their on-screen chemistry or bromance develops through the movie. 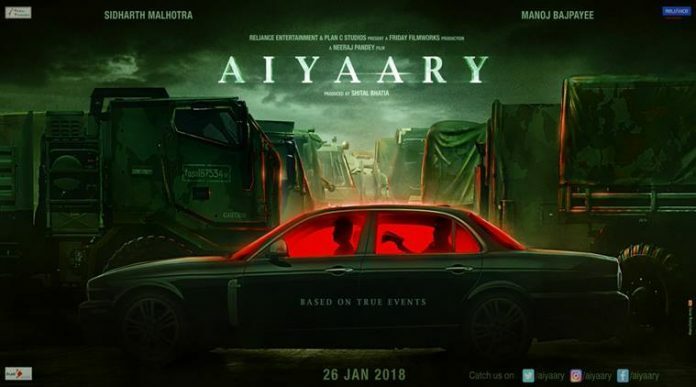 Aiyaary motion poster is a 24 second long animation which focusses on a car with two individuals sitting in it. The dramatic music and dark background add an eerie element to it as the backseat passenger suddenly pulls out a newspaper. Since the car is surrounded by military trucks, it’s safe to say that this movie will have a fair bit of action. The motion poster has definitely caught everyone’s attention and several celebrities including Anupam Kher, lead actors Siddharth and Manoj and director Neeraj even shared the same on Twitter. Aiyaary releases on January 26, 2018. Stay tuned for more updates on the film, exclusively on Bollywood Garam. Previous articleAdel Sajan, Sana Khan wedding Day 1 - Celebrities party atop Costa Fascinosa!